The basic building material was balsa wood, in various sizes and of varying thickness. The walls needed to be at least 1/4in thick, to allow for the embrasures to be cut into them properly, each one being square cut from the front, but having angles on its inner faces, which not only allows the legionnaires to shoot out more effectively, but also to be propped up after death. I have found balsa wood to be a much easier medium to work with than plywood or hardwood providing always that it is well supported with inner props and covered by a thick coating of Tetrion. It will not take too much `knocking about', but, given reasonable handling and a firm base, it should be pretty playable for the average wargamer. I always use a scalpel for cutting and shaping, which is an excellent tool for the job, but one which must be handled with extreme care. The base used was a thick piece of art card measuring 24in x 21 in, the fort being slightly wider across the front. On to this I glued the four main balsa walls, after having cut the embrasures in them, before beginning the corner towers. This was to make sure that the four walls were square to each other before fiddling about with the towers. The length of the walls was judged simply by the number of embrasures in each section, it being assumed that the distance between each would be approximately the same. Oddly enough this rule of thumb is broken immediately because there is quite a gap between two embrasures on the front wall, just to the right and above the door. There is no apparent reason for this anomaly, which leads me to suspect that the fort is copied from a real structure, warts and all. Having secured the walls firmly I then tackled the corner towers, giving each slightly steeper angle inwards than the main walls. This was quite tricky and involved trial and error to a great extent, using the photos for reference. Once finished I squeezed PVA glue into all the inside joints and corners to help give the structure greater strength. The interior needed careful planning, not only to make sure that everything fitted in properly, but also that the heights and widths suited the general plan. 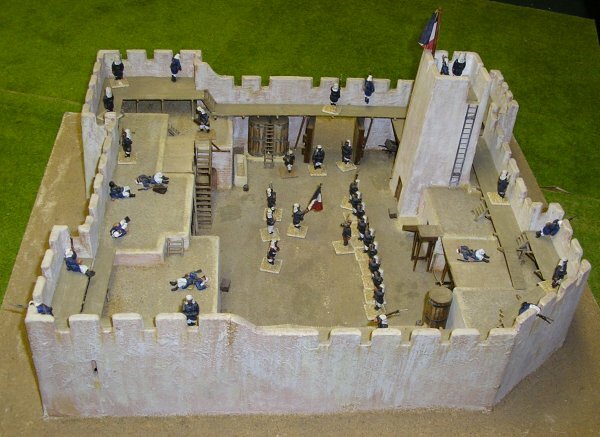 For example, only one roof is used as a shooting platform, a plank walkway which runs around the whole of the interior walls providing the platform for the rest of the fort. This main building height was measured by the simple expedient of standing a legionnaire in the embrasure and marking where his feet rested to give a roof level. The platform height can then be found by the same means, but since most of the other roof levels are different to each other, heights must also be measured by the number of steps in each short staircase leading down from the platform. This is then complicated by the fact that some buildings have a few steps leading from one roof level to the next, as well as up to the platforms. Constant study of the photographs is needed at this stage and each part of the interior buildings must be placed in situ without gluing and judged against its neighbours, as well as against outside windows, doors, platform height and later fittings such as notice boards and benches. The buildings are added... Because the actual roofs are slightly sunken, each interior building had to have its walls made first, and then have the roof fitted, to rest on odd scraps of balsa glued inside the walls. I made the building with the slatted windows first, this being the barracks, or at least the lower part of it is and it is on the roof of this that legionnaires can stand and shoot from the walls. I found the best way to make the windows was to cut out the opening for them and then glue some card across the back to fill the space. On to this I then glued strips of thin card, starting at the bottom and slatted at an angle. The door was made by nearly the same method, a thinner piece of balsa being cut to fit an opening and then scored to represent planking. Having marked out on the base the approximate position of each building, I then proceeded around the inside, cutting and fitting roughly until all of the interior buildings were in place and the heights and distances checked. Out of interest, the actual layout and use of the buildings in the film story is as follows; entering through the main gate the first small building on the right is a storeroom. Then there is a flight of stairs leading to a veranda outside the officers quarters and then the roof. The actual officers' room is above the end of the main barracks, which is the next building. 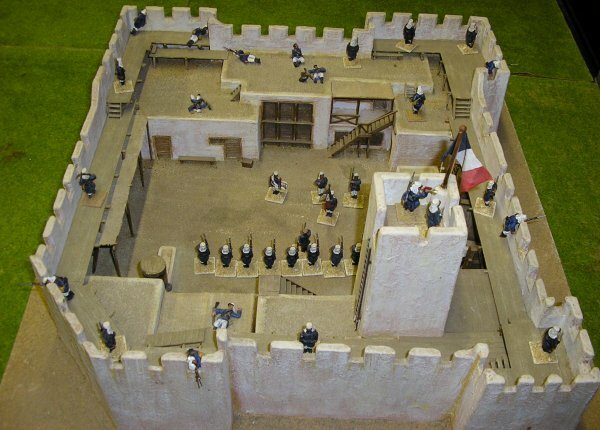 Here there is a divergence from the actual fort as the barracks is sunk and has three or four steps leading down to its entrance. I did not do this on the model as this would have meant raising the whole thing some tin to allow for it. The next small building, between the barracks and the rear wall, is a magazine, which again is sunk some three or four feet into the ground. Following the rear wall round the far building on the left is the guardhouse, then, after an open stable, is the corporals' quarters, the door being under another staircase to the roof. The sergeants' quarters come after that, built into the base of the watchtower, then there is an open space under the planking of the platform between the wall and the watchtower, with another storeroom set at the back of it which can barely be seen. Having made the buildings I then set about making the two main staircases from strips of thin hardwood. This is a real fiddly job, requiring lots of patience. I cut the two sides of each stair, then a number of steps, making sure that they were all exactly the right size, then I glued the top and bottom step in place with fast drying PVA and fitted in the intervening steps with tweezers, getting the distance right with a piece of balsa as a width guide. This works fine until you have to build a landing halfway up, as in the main staircase, and make sure that the whole thing fits and looks right. Still, once completed it looks very effective and with the wood stained dark and drybrushed, it also looks a bit ramshackle, which must be right. Having made most of the interior I fitted the main fort doors, which were cut from pieces of hardwood. The panel frames on the inside are thinner strips of wood, cut and glued on, and the securing bolts are made up from the square strips of hardwood available at all good model shops. They slide back and forth in their retaining straps to secure entry. The actual bolts in the film are more numerous, there being six of them, but considered them to be too small in scale to use on the model to be effectual. The hinges are strips of thin leather pinned and glued to allow the doors to open and close. 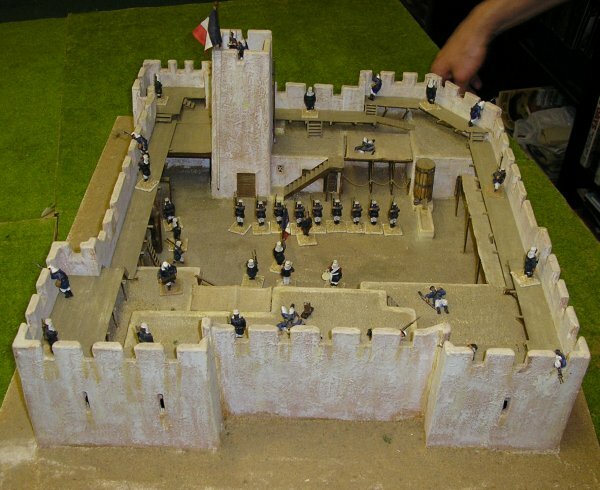 I put the tower in next, made from four pieces of long balsa which slope inwards towards the top, with an entry facing the rear of the fort, from which a ladder descends to the roof of the corporals quarters. With all the various buildings firmly secured I then coated all the walls with a mix of Tetrion and PVA glue, well watered down. The outer walls were coated several times to give them greater strength, and the mix was allowed to slop around the base of the walls for the same reason. This gives a nice texture to the whole edifice. 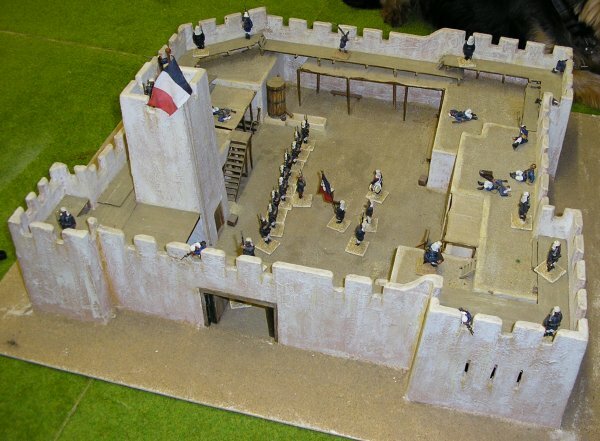 The roofs and floor of the fort were coated in a similar mixture, with less Tetrion included, and while this was wet, birdsand from a pet shop was sprinkled over it, needing several coats and several sprinklings to give a satisfactory effect. I then drybrushed the sand with light ochre and cream, followed by white, using a very old brush and whitening it up considerably before putting in a few stains to break up the bleakness. The safety netting is made from open weave bandages, supported on thin dowelling and the water troughs and barrels were made from odd scraps of wood, the troughs being coated in Tetrion. Cocktail sticks were used to make the platform supports, being cut into halves and pushed into the walls all the way around the fort interior at firing step level, thin strips of hardwood being laid onto this to create the plank walkway. The various little stairways were made to fit where required and the whole was then stained and drybrushed almost white. The outer walls were painted with a thin wash, a muddy pink to begin with, gradually being faded with lighter washes and eventually drybrushed, all the upper surfaces and top parts of the walls being almost pure white, while the lower retained the darker original coats. This was broken up by streaking thin dribbles of darker wash down the walls from the embrasures and in the corners. When all the painting was completed the sand around the baseboard outside was added, as was the tricolour, handpainted onto a scrap of material cut from a handkerchief. This can be raised and lowered by means of a running pulley from the flagstaff to a peg in the foot of the tower. Once finished the fort was immediately pressed into service, manned by the Legions finest, to hold back a horde of screaming Tauregs. Now have to get some dead figures to man the walls to really put on an authentic Beau Geste scenario. To the men of the relief column from Tokatu all seemed well in the little desert fort of Zinderneuf. As they trudged nearer across the sand they could see the tricolour stirring limply on the flagpole atop the lookout tower and at every embrasure stood a legionnaire, his Lebel rifle covering the surrounding desert. It was only when the officer rode forward, raising his hand to halt the column, that the men became aware of the silence and stillness that shrouded the forts mud-brick walls. As they looked and wondered, two shots broke the silence, the bullets sending up spurts of sand near the officer's horse, making it snort and prance nervously. After a moments hesitation the officer rode nearer, calling out to the men at the embrasures. Suddenly his voice died away as he reached the foot of the wall and gazed up at the face of one of the forts silent defenders. The legionnaire stared vacantly away across the shimmering sands, his hardened features impassive. In the middle of his forehead was a neat hole from which a trickle of dried blood ran, coursing its way through the stubble on his chin to disappear under the collar of his dark coat. Recovering himself the officer turned his horses head and slowly rode around the forts walls, staring up into the tough faces of the its garrison. At every embrasure stood a legionnaire, rifle pointing outwards towards the enemy, coat buttoned, kepi firmly pulled down over sightless eyes, but every man bore the mark of the bullet wound that killed him. Dead, all dead. Thus begins one of the all time classic stories, Beau Geste by P.C. Wren, or at least the 1939 film version of same, starring Gary Cooper and Ray Milland. 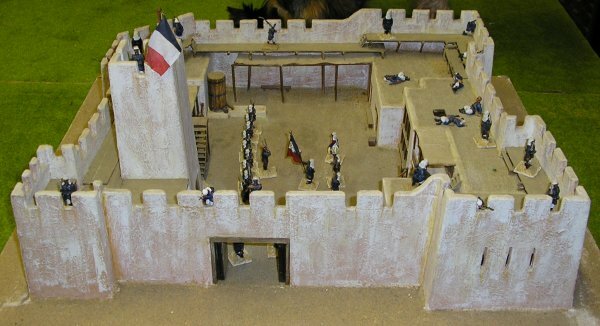 Without knowing any of the details of the making of the film it was obviously big budget for its day, and the fort used certainly looked authentic while still being a Hollywood creation. In certain scenes the camera pans across the whole of the interior, and occasionally during the Arab attacks shots are taken from a high angle at the rear corner of the back wall. I wonder sometimes if the remnants of the original building still decorate some forgotten corner of a Californian desert, or perhaps full plans lie mouldering in studio store. In any event, inspired by the recent release of the March or Die range of Foreign Legion and Tauregs from Redoubt Enterprises, I decided to have a go at building a 25mm model of the doomed structure. The first need was for layout information so I got out my trusty S.L.R. camera, fitted a 70210mm lens and ran the video. I found that I could get quite good pictures on freeze frame without using flash by making sure that the TV picture filled the whole lens. The quality was not brilliant, but quite acceptable, providing plenty of detail to work from. Not being a professional model builder, my idea of scale is whether a building 'looks' right, so I began by using one of the photos from the start of the film, when a legionnaire stands in front of the wall with a grappling hook. Gauging his height at roughly six feet, I estimated the walls to be roughly 20 feet high, with the towers slightly higher. The odd thing about the fort, and one of the trickiest problems in the planning stage, is that the corner towers are all of odd shapes, none of them being the same size and the rear left hand corner, viewed from the gate, not being square at all, but cutting diagonally across from a projection out of the left hand wall to the back wall. This is apparent from scenes shot inside the fort during the film, perhaps something to do with the demands of the camera rather than real life as it is from this corner that the birds-eye views are taken.